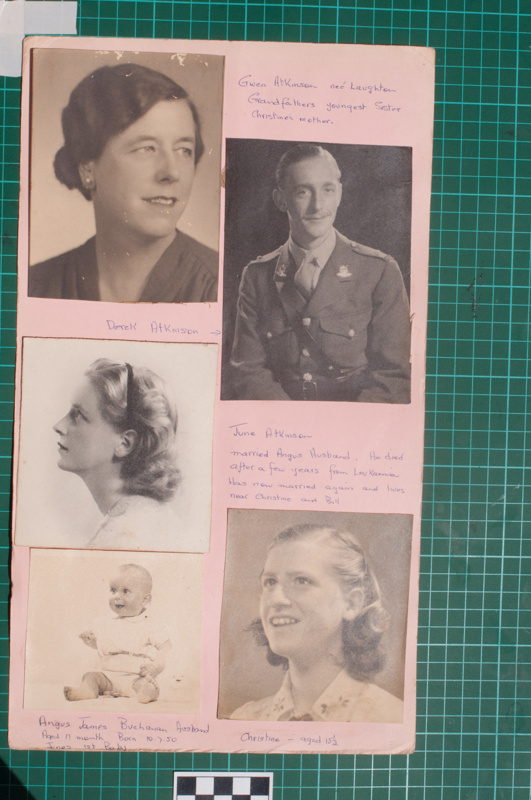 Five photographs mounted on a pale pink foolscap card with handwritten annotations in blue ink below. Described from top to bottom, left to right. Top Left: Portrait of Gwen Atkinson Nee Laughton (Gwendolen Edith Muriel Laughton b: April 1890 d: 6.12.1957), grandfather's youngest sister, Christine's mother. 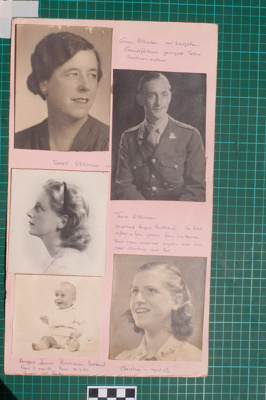 Top Left: Portrait of Derek Atkinson (son of Gwen and Archie); Middle Left: Portrait of June Atkinson (daughter of Gwen and Archie) A note reads: 'married Angus Husband. He died after a few years from Leukemia. Has now married again and lives near Christine and Bill.' Bottom Left: Potrait of Angus James Buchanan Husband Aged 11 months born 10.7.50 (Died 29/06/2008 in Blackpool). June's first baby. Bottom Right: Christine (daughter of Gwen and Archie) aged 15 1/2.